These Southwest Eggrolls are a lot like the ones you get from Chili's. In a large skillet (and I really do mean large! ), sautee onions and peppers in butter until lightly browned and tender. Add beans, corn, chicken, and spinach. Season to tase—I use Emeril's seasoning blend, which according to this recipe has paprika, salt, garlic powder, black pepper, cayenne pepper, onion powder, oregano, and thyme. Cook on medium-high heat until all ingredients are hot and spinach (if fresh) is moist and wilted. Remove mix from heat. In skillet (I usually empty the filling into a bowl, rinse the skillet, and reuse it) heat vegetable oil with your stove set to just above medium heat. You want enough oil so that it will cover at least 1/2 of your wrapped eggrolls. (Oil will pop a lot when it is ready to use.) 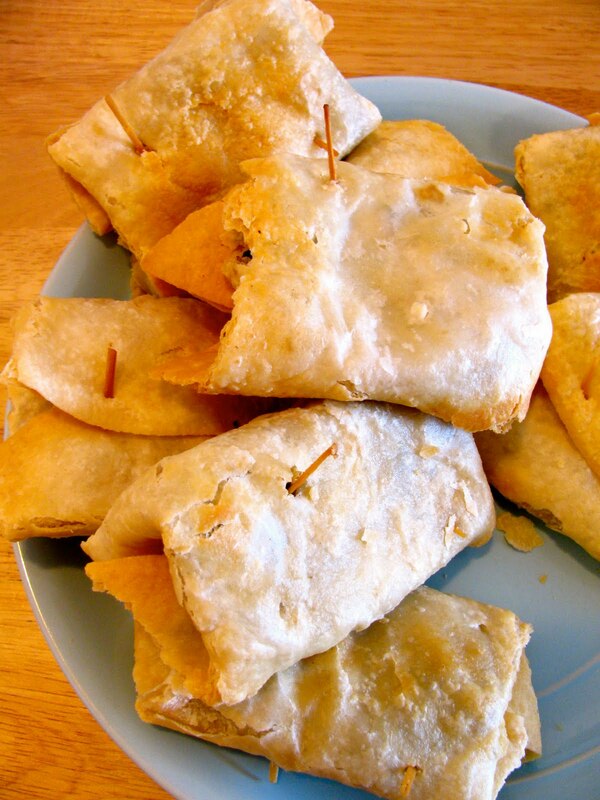 While oil is heating, fill won ton wrappers or tortillas with filling. Won ton package will tell you how to seal the wrappers; if you are filling tortillas instead, use toothpicks to keep them closed. Once oil is hot, place sealed eggrolls in skillet. Fry until lightly browned on each side; remove with tongs and let drain on a plate covered with a paper towel. Serve hot. For a dip, mix equal parts Ranch dressing and salsa. Enjoy—these are seriously addicting! The nice thing is that if you don't use all the filling, you can freeze it and pull it out another day and have egg rolls again. Cindy Lynn has modified my recipe but I use a full box of spinach and I season until it has some bite. The bite will become milder with the wrappings around it. Another new thing I haven't told CL is that now I also add about 3/4 cup of cheese to the mixture after it has cooled slightly in a bowl. Also - I forgot the cheese! I put the cheese in sometimes, usually only if I make it with tortillas though. Had some of these for lunch. The sauce is an excellent complement!